The 2030 Agenda for Sustainable Development calls on all countries and stakeholders to work together to end hunger and all forms of malnutrition (SDG 2). Starting this year, the five Regional Food Security and Nutrition Overview Reports mark a new era in the monitoring food security and nutrition in the context of the 2030 Agenda. The reports are reformulated to complement the global report on the State of Food Security and Nutrition in the World, providing more in-depth regional and country assessment of progress and an analysis of key drivers of the food security and nutrition outcomes in each region. The reports also review policies aimed to reduce food insecurity and malnutrition, offering examples that are contributing to reductions in food insecurity and malnutrition. While much progress has been made towards reducing hunger, the rate of reduction has slowed and in some regions there are early signs of a reversal in the downward trend. This CFS Side Event takes a closer look at the key regional food security and nutrition findings in each region, highlighting key drivers, and emerging issues. A panel discussion provides an opportunity to hear directly from Member State representatives on what is working and where there are challenges, offering an important opportunity for cross-regional and country learning and exchange. Ms. Maria-Bernardita Flores, Assistant Secretary of Health and Executive Director IV, National Nutrition Council, Department of Health, Republic of the Philippines. 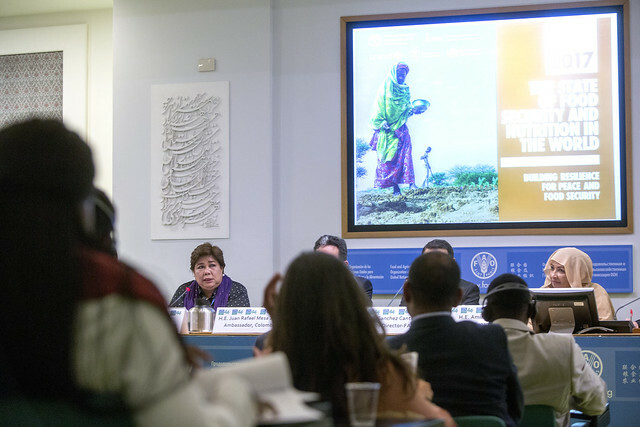 This side event discussed: the key drivers of food security and nutrition outcomes based on the State of Food Security and Nutrition in the World 2017 Report (SOFI); and lessons learned from conflict-affected situations in different regions, focusing on policies aimed at reducing food insecurity and malnutrition and the challenges facing the achievement of SDG2. Addressing food insecurity and malnutrition in contexts of conflict requires new ways of working applying conflict-sensitive approaches in implementing policies and programmes. Panelists provided valuable country perspectives on “better ways of working” in conflict-affected situations, illustrating what conflict-sensitive approaches means in practice and what we can learn from their experience. Competition over land and water is one of the leading triggers for conflicts. Columbia is one of the only countries in the world that has implemented a land restitution policy during conflict. In addition, a legal framework was put in place to support the populations displaced as a result of conflict, helping to sustain peace by restoring land to people as well as their livelihoods. Many conflicts are deeply rooted and prove intractable, therefore it is important to think, invest and act in the long-term and to work to address the root causes of conflict. Conflict events have increased dramatically in last decade and the nature of conflict is also changing. Some conflicts are occurring at a more localized level, of low intensity and are prolonged. The Philippines is experiencing a very localized and low intensity conflict and the impacts are proving devastating to the child nutrition, especially among internally displaced people. In response, the Government has implemented programmes to respond to immediate needs (i.e. distributing powder milk, child monitoring and providing supplements, provide family food packs), while also addressing the underlying causes and challenges (promoting breastfeeding and nutrition educational). The Near East and North Africa as a region is suffering from the aftermaths of devastating wars and crisis in several countries, which have disrupted and destroyed rural livelihoods and food systems, while undermining the ability of households to cope with shocks and stressors. The region is one of the largest recipients of humanitarian aid, but there is an urgent need for increased Official Development Assistance (ODA) to expand investments in agriculture and food systems, as well as building the resilience of vulnerable communities. Ending hunger and malnutrition will be out of reach for many countries affected by conflict unless all the factors that undermine food security and nutrition, including violence and conflict are addressed. Policies and programmes aiming at strengthening resilience need to be conflict-sensitive. More integrated and better coordinated interventions across the humanitarian-development-peacebuilding nexus are needed.